Michael has lived in New York City most of his adult life. He feels nothing personifies American spirit and pride more than the Statue of Liberty. The statue, alongside other famous New York City landmarks: The Empire State, Chrysler, Citicorp and Woolworth buildings, seemed a fitting silhouette for the patriotic piece. 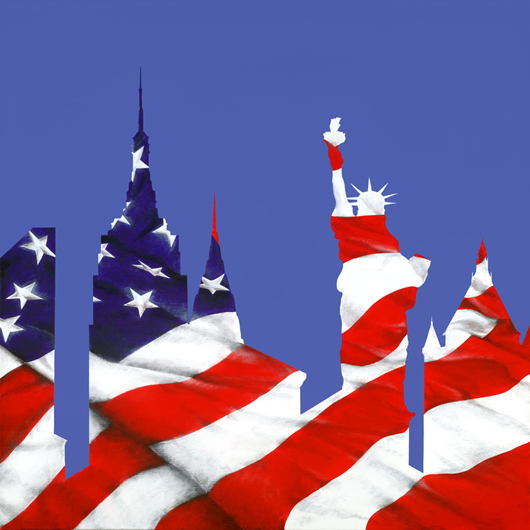 New York, Old Glory is being offered as a giclée on canvas print, with a limited production of 75 signed and numbered pieces. The canvas measures 24" x 24"
of applicable laws and is strictly prohibited.